The New England Ski Museum will hold its first-ever golf tournament at the North Conway Country Club on Monday, September 25, 2017. The proceeds will benefit the renovation of the former North Conway Community Center building into the museum’s new Eastern Slope Branch, which adjoins the country club. The tournament format will be a four-person team scramble with a shotgun start at 10:00 am. Registration begins at 8:30 am. The registration fee is $125 per player, which includes greens fees, cart, post-event appetizers and goodie bags. Organizers expect that Valley veteran of the U.S. Ski Team and the Winter Olympic Games, Leanne Smith, will play in the tournament. 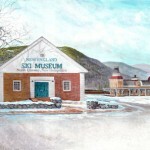 Smith will be represented in the Eastern Slope Branch museum when it opens. The Museum is currently conducting a raffle of a football signed by New England Patriots quarterback Tom Brady, and the winner of that raffle will be drawn at the golf tournament on September 25. Tickets to the football raffle are $25, and only 250 will be sold. Raffle proceeds also support the museum’s Eastern Slope Branch. The Eastern Slope Branch is expected to open by the end of 2017. The original museum in Franconia Notch State Park will remain open seven days a week from Memorial Day through the end of ski season. Registration and sponsorship for the golf tournament is via Ingrid DeWitt, 74 Pauli Point Road, Freedom, NH 03836; ingriddewitt@roadrunner.com; 603-539-4142. Raffle tickets for the Tom Brady football raffle may be purchased by calling the Museum at 800-639-4181 or at the museum shop website, http://www.newenglandskimuseum.com/tom-brady-signed-football-raffle/.